On with an annual tradition, I have gone through my Flickr photos for 2012, and have curated the best 100 pictures of the year. Without further adieu, here is slideshow that was the year 2012 for me. The slideshow is best enjoyed with the soundtrack that I have also put together for this. This is a continuation of my long running self-documenting history of my journey as a founder attempting to transform an idea into a real-life product. One the previous episode entitled, "Winter Is Coming," we went through a storm which almost wiped out my team, but we emerged from it stronger than ever. I've gotten a lot of pity comments from my last blog posting, and a lot of questions if I'm mad about the situation. I say this with utmost sincerity, I am not mad at all. On the contrary, I think it's a great story of redemption. I've told my management chain, that I have learned more this year than my entire career with the company. My outlook on this is: it's better to learn all this stuff now, so when I start my next big idea, I'll be ready for bigger challenges. I'm not looking for pity, I'm just writing this down so the next time this happens, I recover faster. I feel it's important to remember the good times and the bad times. The team's morale was on the rise after our successful user experience testing in November. Some of my greatest opponents had also switched sides and started backing us again. As we entered December, we had the company Christmas Party which was a welcome distraction from reality, and an opportunity to celebrate what we had accomplished thus far, we were feeling pretty good. Nevertheless, I intended to leverage this high morale for one last battle before we all left for Christmas Vacation; the goal was to secure a second round of funding for our product. If we didn't pursue funding in December, it would take a while to get everyone back up to speed after vacation, and audiences to the higher ups would be harder to get. We had two weeks to put together a new pitch. We immediately booked an audience with a committee that the King (who reports to the CEO), and all of his top advisors and lieutenants sit on. Rule number one about presentations, know your audience. So, we met with some committee members who we had built relationships with; the goal was to judge the political climate in that committee. Unfortunately the week before, some team got absolutely destroyed in their presentation because they launched something without anyone on the committee knowing, and some heads rolled. Teams going in to present would be scrutinized much more as a result. My product manager bumped into The King in the elevator, and decided to give an elevator pitch of our idea. While I appreciated the zeal behind the idea, it didn't really work out because the delivery of the pitch wasn't very polished at this point. The King got confused and didn't really understand the value proposition, and brushed off the idea as, meh that sounds pretty obvious to me. When my product manager told me what had happened, I asked, did you show a demo of the product on the mobile phone? The answer was no, and I was relieved. My hope was that The King would just completely forget the incident because he hears so many pitches every week. We had our work set out for us, we had to reset some impressions. The following week, we worked night and day putting together our presentation. I worked with my last remaining loyal engineer covertly on a more polished demo of our product. In my books, working code speaks louder than powerpoint slides. I worked with my product manager to make her talking points much more concise, and helped clean up her slides as they were a bit wordy. I helped enhance the business story by infusing metrics and data into the business models. Our presentation would only be 10 minutes long, with 20 minutes of Q&A, and we had 40 slides. We did a test run of the deck with a couple of our allies from the committee. They threw hardball questions, and I was able to defend on the fly. They liked what they were hearing, and assured us that they would be rooting for us. The main problem was our deck was way too long, and I had to mercilessly cut out as much as possible. At the end of the exercise, we got our deck down to 20 slides. We handed in the presentation deck 3 days before the pitch to the King's right-hand man to review (I refer to this character as The King's Hand). The feedback we got from The King's Hand, and from my product manager's boss. They felt that the deck seemed to be filled with a lot of fluff, and not a lot of facts. They wanted us to make some heavy revisions to the deck. The fluff they were referring to were some slides where I have a single beautiful picture, and nothing else. As a minimalist, less is more when it comes to presentations. I prefer to do story telling in my presentations while reinforcing my points with a single prominent picture. Thankfully my product manager defended the work saying, "I appreciate the feedback, but this is Chris' style, and he's been very successful with the format. Believe me, this isn't a fluffy presentation, a lot of the hard facts are in our talking points. We will not be making revisions." I was glad my product manager had the courtesy of preserving the integrity of our work, it would have been easy to just cave in to demands from people of authority. The King's Hand seemed skeptical, but allowed us to proceed. The product manager's boss felt very nervous as he preferred presentations packed with tables and diagrams. The day had come for us to pitch to the committee. We got news in the morning that the King would not be in attendance because he was out of town on a business trip. I dreaded this answer because I still haven't had an audience with him in person. I would also have to deal with this nonsense that if I got my funding request approved, people would always ask, did you run this by The King? The King's Hand assured me that they had quorum that day, and the major stakeholders that deal with funding would all be present. Earlier in the year, I was pretty afraid of presentations, but I had to pretend that I wasn't afraid. After a year's worth of pitching, I think I've given 40+ presentations, and each time you get a little less afraid. At some point, your pretend character becomes your real character, and you just stop being afraid. The eternal optimist in me believes that some dreams just have to die, but new opportunities will rise from those ashes. I am ronin, I have nothing to lose, and everything to gain. It's a win-win situation in my books. I've got plenty of other ideas that I would seek funding for. That's when my product manager mentioned she used to run an investment group that was called "Ronin Partners." I guess I'm decent at putting together a team of like-minded trouble makers. It was time for the presentation, so we went up to the big conference room. We were first up to present, and thankfully they told us that the second group to present had cancelled so we had plenty of time. I started the presentation with a demo of our product which was pretty darn polished. I could see people's eyes dilate when they saw it, and lots of smiles emerged. I kept my eye on the King's Hand the entire time because we absolutely had to win him over. As I walked through the presentation, questions came from the audience and I answered every one with ease. I could see the King's Hand starting to drop his guard. My reality distortion field was set to maximum. By the middle of the presentation, I handed off the reigns to my product manager. She started walking through the business model, and I could see heads nodding in agreement. Some people even felt that the numbers were on the conservative side, and could see this thing being bigger than projected. This was a good problem to have, it's far better than being accused of being too optimistic or fudging the numbers. The presentation ended, and The King's Hand took the stand and congratulated us on a very good presentation. He then asked the VP of Engineering if he had resources for us. The VP asked one of his lieutenants (someone in my management chain) if we had resources for me. A quiet answer came out, "yes if you feel this is important." The VP of Engineering (the original guy that approved my funding) gave me a wink and said, you got your funding, go get them. I thought I was home free until someone asked, "has The King or the CEO seen this presentation yet?" I answered "no, but they would be seeing it before it launches." A bunch of mini-discussions broke out. Someone took the floor and said, well, if the CEO doesn't like it, then your project is dead, shouldn't you review it with her before moving forward? Gah. The King's Hand reigned in all the conversations and said, since there's uncertainty around higher level approvals, take this to the King, and then to the CEO. The committee would approve funding once the higher ups approved. This wasn't the outcome I was expecting. We had less than a week to book an audience with The King, and pitch. We had a couple days to make addition fixes to the presentation. We needed some more polished mocks of what we were trying to build, so I went to my designers for that. Strangely enough their managers didn't like the idea of us showing mocks that they had not personally approved, and the approval process would take a couple days. They were afraid that they would be criticized for using wrong colours or some other design flaws. I had to push back because I had no time left, and told them, "look, I'm just trying to sell a vision here, it doesn't have to be perfect, I think a SVP is smart enough to know that this is not the final design." I don't think they officially sanctioned what I presented, but oh well. The King's Hand and my product manager's boss also gave us additional feedback for tweaking the deck. Again, they were concerned that some key information wasn't explicit enough. They were worried that The King didn't have the proper context, and in 15 minutes we wouldn't be able to communicate the key points. They wanted us to reorder the pitch to cover the business stuff first. I was a bit dumbfounded by this feedback because I had JUST presented this deck to the committee and everyone thought it was excellent. I didn't get why everyone was assuming that The King was a dumb person that needed a lot of handholding in a presentation. Was it wrong that I assumed that The King sits on the throne because he has deep knowledge and expertise in our business? Surely a lowly peasant such as myself would know a lot less about this domain. I ended up not changing the presentation. The day of the big meeting with the King came. My co-workers saw that I was in a powershirt and knew something big was going down. One of my co-workers started poking fun at how I was dressed, he claimed that I've become corporate and no longer an engineer. That crossed a line. After being accused of being corporate, I started unbuttoning my powershirt. My co-workers didn't know what on earth I was doing. 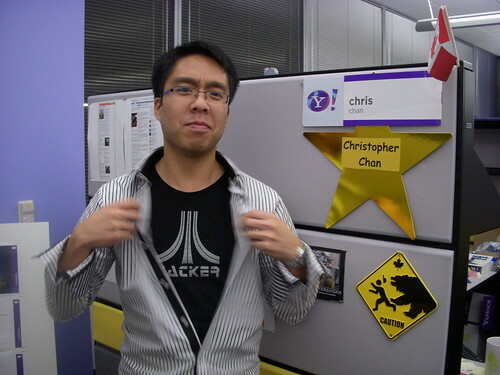 Underneath, I revealed the original Q1 Hack Day champion t-shirt that started this whole journey. I told them, "underneath all of this, I am a hacker at heart, this reminds me where I have come from, and who I am." That co-worker that was poking fun suddenly didn't have any comebacks. Owned. The others started laughing at him. On the heels of verbally destroying a co-worker's ego, I was ready for my audience with The King. In the room was just the product manager, her boss, and I. The King walked in, and he said, "alright, show me something cool, don't show me a boring deck, show me some working code. I'm tired of decks." I laughed a bit on the inside because everyone was telling me to start with the business plan instead of the demo. The hacker in me knew to always start with a cool demo, and I was glad I stayed true to that. I showed him the demo, and he really liked what he saw. I proceeded with the story of how this idea came about, and the vision around it. The King then asked me, what are other applications of this idea? I had about five seconds to think about this and come up with an answer. I had a canned answer that I thought he wanted to hear, and then I had an answer that was a gamble. The gamble was citing a product that we had built in the company which failed, but I thought the idea was good, but the execution was poor. Promoting something that failed seemed like a bad idea, but I decided to go off script and gambled with the answer. My product manager nervously looked at me as I started citing a product and business area that she knew nothing about, and definitely not part of the plan. I saw the King processing what I had just told him. The King spoke and said, "you know, I worked on the exact same thing in my last company, and I love that space. I think that's great, and I can already think of who we could partner with to get that done." I caught myself momentarily in awe/dumbfounded that the gamble worked out. I had no prior knowledge about The King's former triumphs. Phew. As much fun as I was having, the other boss in the room then suggested we go over the business plan. We went over it, and The King didn't really seem to care how much money we would make off this idea. He kind of dismissed it, and said, "you folks need to focus on building a really cool product, the money will come later." I felt liberated that the money side wasn't his primary concern. My product manager then asked the million dollar question, would The King be willing to present the idea to the CEO. He seemed kind of offended and asked why CEO approval was needed? We told him that the committee wasn't sure how good of an idea this was, so they wanted CEO-level approval. The King dismissed this notion and said, "no, I think you have the right decision makers and partners in this room, your funding is approved, go talk to this person for resources." Our time expired, and we were quickly ushered out of the room. It took a while for everything to sink in, but we had done it, we had secured our second round of funding. That 15 minutes changed everything. I'm glad that we didn't try to change our pitch to what other people thought it should be like. I'm glad that The King was a lot smarter than everyone gave him credit for, and he was very decisive. I spent the rest of the day meeting up with my team members and thanking them for their hard work leading up to the holidays. Now we could breathe a sigh of relief and enjoy our Christmas vacation. The next day, I was flying back home to Canada. My product manager dropped by as I was about to leave to catch my flight. She gave me a thank you card, I opened it up and it was a poker themed card. She alluded to the fact that she can't read me, and even in super stressful situations, I maintain a poker face, and nothing seemed to faze me. I also apparently like to gamble big with this project. Guilty. As I got onto the plane, I felt vindicated. Just two months ago, we were facing down utter defeat. Now, everything has changed again. One of my friends commented how this whole journey is like watching a movie, with plot twists coming in at just the right moments. I guess this would make a great movie scene as this chapter of 2012 ends as I ride off into the sunset in a plane bound for home. This piece continues on from a previous article I wrote entitled, "RealPolitik," which is a self-documenting history of my journey as a founder attempting to transform an idea to a real-life product. A brief update from last time, the new leader that I alluded to last time has left the company, so that's one less thing I have to worry about this quarter. As I entered the month of August, I thought things were going fairly well with the progress of my product. I finally had engineers, product managers, and designers starting to work on our product. We had finished several sprints, and we thought we'd be done in no time at this rate. We had a new CEO in place, and morale was very high. Could this finally be peace time? I have to admit, a part of me privately wondered how long these good times would last. I ran into a co-worker who was put onto one of the CEO's highest priority projects, and I asked how things were going. Her response was, "brace yourself, winter is coming, there is a storm coming." I wasn't precisely sure what to make of it, but it didn't sound good. When we entered September, the climate started changing. We finally managed to get some bandwidth from a designer to start working on our product. Unfortunately within a couple weeks, she was let go. It would be a while before we could find a new designer, and get them up to speed again. I thought, that's fine, I could fill that gap with my own design skills, no problem. I didn't realize this was the edge of the storm. As I'm trying to deal with this first loss, my manager pulls me into a meeting. He tells me that he was transferring to another team which had better opportunities. My heart sank because he was a really good manager, and he gave me a lot of leeway to pursue my dreams, and shielded me politically from a lot of non-sense. He wanted to manage a larger team. My pitch to him was, why not just sit back and watch my funding come in, and watch the team slowly grow? That apparently wasn't enough, and so he left. A week later, my co-founder wanted to meet with me, and I'm informed that he's leaving the company. I couldn't exactly comprehend it, and I certainly didn't see this coming. We had won so many awards together this last year, we just had to translate those ideas into reality, and we would claim our prize. I fancy myself as a pretty decent negotiator, but I couldn't turn the tide. We had a very honest and open discussion, and we focused on what was best for him. I am glad that I wasn't the reason for his depature, and we left on very good terms. Trying to cover an engineering manager role, a designer role, and an engineering role was going to be very tricky. I wear many hats, but there are simply not enough hours in a week to cover all of this. I bumped up my hours and started working evenings, but it just wasn't enough. We entered into September with a depleted force, but we managed to get a new designer onboard. We went through a design review of what we had so far, and the design leadership didn't like what we had. When we started the project, it was pretty straightforward in that everyone was working out of consensus. Now that were involving external groups, conflicts and arguments starting breaking out. Engineering, design, and product management all were pursuing different directions and we were deadlocked. In an attempt to break the deadlock, a data-driven design guru was recommended to me. I brought him in hoping that he would help get us back on track. We brought the guy into a meeting, and I had really high hopes for what this guy could do. The Guru was evangelising a design process that would guarantee great emotionally designed products, and wanted us to follow the same process. Unfortunately the process was very abstract and hard to understand. I mentioned that his design process was similar to what one of the design heads already had, so couldn't we just use the same process? The Guru got offended, and was blaming the design head for leading the company astray. A red flag instantly went up for me because this guy obviously has an agenda. He then started showing some of the product ideas that he had been pitching, and started name dropping very high level people in the company. The product ideas were mediocre at best, so I asked him, which one of these products are currently funded and in development? He said none of them, but he blamed his product manager for not pushing hard enough. I was starting to see a pattern here. This guy was all talk. The Guru then started reviewing our product, and mentions how we need to model the user interface as physical objects. This design philosophy is called skeumorphism. In the early days of computing, we needed skeumorphism because people weren't used to computers. That's why your operating system has files, folders, and trash cans. However, there's a new generation called "The Digital Natives" who grew up with computers and intuitively understands computers, and doesn't need real world object metaphors, or the real world metaphor doesn't make any sense. For example, some applications that manage your contact list is modelled after a rolodex; but ask a young kid what a rolodex is, and they'll have no idea what it is because it's obsolete. Things got worst when The Guru suggested we needed some cartoonish character to guide users through our product like Microsoft Clippy. He asserted that Microsoft Clippy brings joy to users. I for one hate Clippy, and I believe Microsoft killed off that character for a reason. This was when I realized this expert's knowledge of users and trends was stuck in the 90s. It really took all my restraint to sit there and listen to this deluge of academic speak of how great Clippy was. The breaking point occurred when The Guru wanted to add his own twist to my idea. He was going to take the idea, add some cartoonish characters and pitch the idea to VPs for funding. Without asking for permission or what I thought about it, he felt like he could just take my idea. Great, I had just created a competitor. I now suddenly had to get in front of VPs before this guy did to ensure they knew where the original idea came from, and ensure this guy was written off as a copycat. The visit with The Guru was an absolute disaster. He told us to go back to the drawing board, and it really broke down a lot of the consensus that I had built up. Suddenly engineering, product, and design all had differing ideas of where to take the project. We had lost the vision. A week before our quarterly reviews, I got a cryptic warning that the higher ups are not happy with my progress. The short version of this was, a launch date was communicated up the chain, but the revised date wasn't, so everyone was expecting something, and we didn't deliver. I was absolutely blind-sided a week later when they announced our funding was cut, and all resources were being diverted to other higher priority projects. I had reached a breaking point. I was running on empty, and with everything else that had already happened, I just didn't see how we could recover from this. The design team was blocking all our progress thanks to The Guru. Half my team had left in the previous weeks. The remaining half was shocked, angry, and confused. We were dead in the water. We had three more weeks before the team would be dissolved. In hindsight, I think I was burned out. I looked like an absolute mess, I hadn't shaved for weeks. My hair was in dire need of a haircut. Every morning when I woke up, I didn't want to go into work. I was eating too much, and gained 8lbs. I sat through team meetings listening to people argue about the direction we should go, and I just sat there, indecisive. There were two primary things gnawing away at me. One, I had jeopardized a bunch of people's livelihoods (career wise), and their only mistake was choosing to follow me. The second question that kept repeating in my mind was, what could I have done differently? The day we lost our funding, I ran into my mentor, and he asked how things were going. I gave him a short version of the story, and he seemed troubled. He then offered to take me into his team. He didn't really understand why I bothered putting up with all of this. I had a lot of thinking to do. My mouth kind of hung open because it was exactly what I needed to hear, at exactly the right time. The good Lord works in mysterious ways. I had come too far to quit now. I had to stop feeling sorry for myself, and get back into the fight. I spent the following week getting myself fixed up and tried to get inspired again. I had to look back at the beginning of the project, and understand what made us successful back then, and where did we go off the rails. I started re-reading my blog articles from earlier in the year, and it started rekindling a fire within. It reminded me, who am i, and what we set out to do. You, me, or nobody is gonna hit as hard as life. But it ain't about how hard you hit. It's about how hard you can get hit and keep moving forward. How much you can take and keep moving forward. That's how winning is done! Now if you know what you're worth then go out and get what you're worth. But you gotta be willing to take the hits, and not pointing fingers saying you ain't where you wanna be because of him, or her, or anybody! The inner computer geek in me installed the strategy game Civilization 4, and I built and managed an empire over the weekend. There's something about destroying other empires that made me feel better. It made me feel like I was in control of something important again. I hit the gym and started working out again. I started off with a 5km run on the treadmill. Over a week, I lost the 8lbs. I shaved the beard. I went to a hair studio and said, "my hair is a mess, give me a new hairstyle, do whatever you want with it, but it needs to look clean and professional." In the midst of this, I was also watching "The Men That Built America," which went through the history of some of America's greatest entrepreneurs. There's a story of Tesla vs Edison which was quite inspirational to me. Tesla was confronted with a decision that would either see the world adopt his technology, or he could be rich in his career as an inventor. He decided the technology was more important and gave up rights to all his patents, and died a poor man. There's something very noble, inspiring, and liberating about that. I thought to myself, perhaps career isn't as important as building world changing technology. In either case, I decided I couldn't abandon the project now, even if it puts my career in peril, I couldn't leave for somewhere else, I had to finish what I started. Otherwise, what does that say of my character? When things get tough, I just quit? I got back into the office regenerated, and ready to fight again. People said I looked like a different man, and welcomed me back. My first order of business was to rally the troops. I sent out an email acknowleding what we had gone through, but now was the time to finish strong. We had two weeks of funding left, and I wasn't going to squander that time, we would go down fighting. My second order of business was coming up with a new design for the product that would get approval from our designers. It would hopefully also get people to unify around a renewed vision of the product. A couple days in, I came up with new concept drawings, and took them to my sole remaining engineer. We had a mini hack day and built a working prototype in 6 hours. It looked very promising. Next thing on the agenda was diplomacy to rebuild peace with my management chain. I went up the chain to try to figure out what we could have done differently last quarter. I actually got a different kind of answer. I was told, in the end, ideas aren't worth a lot, execution is everything. One of my managers hinted that the reason why nobody listens to The Gurus was because they're all talk, but they can never get a product off the ground. Products that have actual customers using it is valuable to the company. My answer to that was, well give me 50% of my time back to work on executing on this product. It was granted. I'm very glad that I reached out with an olive branch instead of burning that bridge down. Minimal funding was restored for the rest of the quarter, but we would be on life support. The final order of business was to get The Guru off our backs. The arguments we were having were basically endless debates that were not backed by data, but by taste and opinions. I halted all debate and said, I'm going to run a usability study with real users, and we'll let our users tell us where the product should be heading towards. The Guru was dismissive about usability studies saying your methodology will be all wrong, and the data we collect will be useless. I knew for a fact that a number of new flagship products from Yahoo! were going through usabiliy studies with the CEO's blessing, so I was going to see how those studies were being run, and try to do the same thing. 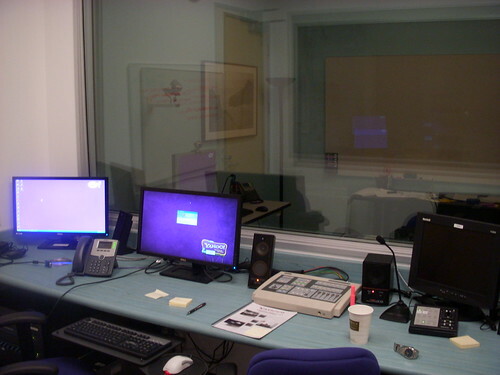 I met with the director of usability studies to see if we could borrow their facilities and resources. We explained what we were trying to break a deadlock over very opinionated people. At first he was hesitant because the labs were full, and he couldn't spare any resources. As we're wrapping up the meeting, he discovered that we came out of Hack Day with this idea, and said, "you know what, I have a soft spot for people like you coming out of Hack Day, I'm going to personally help with this." I choked up a bit, and couldn't thank him enough, this was our ticket to breaking the deadlock. We met with his staff a couple more times, and they approved our methodology and test. When we finished putting together the experiment, and began inviting external users to come in, the director gave us the keys to the lab for two weeks. I couldn't believe we had the labs all to ourselves for two weeks. The previous month they were booked completely solid. Strangely enough, the lead designer saw that we were making progress on new designs, and gave us an additional designer to help. A couple weeks ago, the lead designer was thinking about pulling all our designers. Now she's adding reinforcements. The usability testing went really well, and we got a lot of great positive feedback from our users. One of the usability folks gave us a hint though, she said call it 'user experience testing', and people will take you more seriously. I thought this was ridiculous, we're just playing with semantics. When we met with The Guru again, and mentioned we had just completed 'user experience testing', he says, "oh of course you have to do user experience testing, it's very important to do that." I sighed on the inside. He spent ample time dismissing these tests, and now was endorsing them? I presented our findings to my management chain, the designers, the Guru, and folks from the product management side. Basically a lot of our assumptions were validated, and the new designs I had come up with were far superior. The Guru was completely disarmed because he couldn't argue with the data that we had produced. We had pivoted to a new vision, and everyone was onboard. The management chain concluded with this decree, "the SVP needs to see these results, go get a second round of funding." I was absolutely shocked how our fortunes had completely changed in the span of weeks. People who were trying to shut down my team were now becoming our greatest advocates. I brought the team together after, and acknowledged that going through the trials and tribulation were hard, but I felt like we grew as a team, and we're stronger than ever now. I think everyone shared a similar sentiment. I feel quite blessed because it would have been easy for anyone to quit when the going got tough, but they stuck it out with me. Stay tuned for the next installment of the story.